The first version of this blog was published on the pedagoo.org site. In biomedical research, small model organisms such as the fruit fly Drosophila melanogaster are important pillars in the process of scientific discovery. For 27 years, I have been using Drosophila as my organism of choice and the essential discovery tool to study fundamental principles of the nervous system (LINK1 and LINK2). For more than 6 years, together with my colleague Sanjai Patel and other members of the Manchester Fly Facility, I have been actively engaging in science communication to raise public awareness of the importance of fly research, with a strong focus on school activities (see further explanations here). From this, we realised the enormous potential that Drosophila has beyond research also for biology teaching. It is a powerful modern teaching tool not only for classical Genetics but for many curriculum-relevant areas of biology, providing unique access to informative, inspiring and memorable classroom experiments. As is explained in our recent articles (see resource box below) and the 1st movie below, we now collaborate with teachers and schools on the droso4schools project, to capitalise on the advantages of Drosophila and develop freely available sample lessons with adjunct materials (e.g. teacher notes, risk assessments, homework tasks, exercises, experiment instructions), and a . Furthermore see our repository with downloadable resources for extracurricular school visits (LINK). Why is Drosophila so important for biomedical research? …that it is the astonishingly high degree of evolutionary conservation from flies to humans that makes understanding of biology in flies so relevant for biomedical research even into human disease, having led to five Nobel prizes in Physiology and Medicine so far. Why is Drosophila so useful in biology classes? “I am a drosophilist”: students at Trinity CoE High (one of the schools we collaborate with) like the fly! As will become clear from the sample lessons explained in the next section, there are two important advantages for using Drosophila in classrooms, in particular (1) the breadth and depth of conceptual understanding of biology in the fly, and (2) the fact that flies are uniquely suited for live experiments in schools. 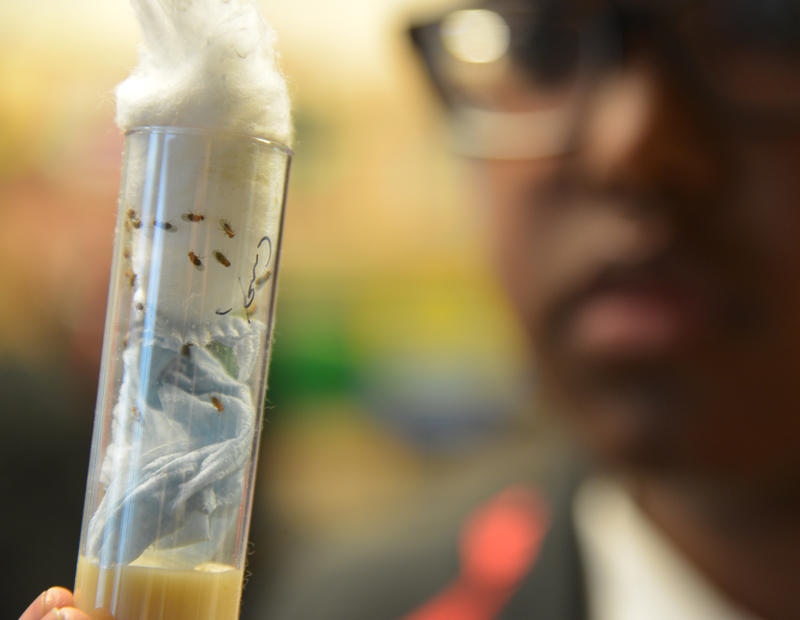 Flies are kept in small vials with a bit of food at the bottom: ideal for maintaining them even in schools. Conceptual understanding: A century of cutting edge research has turned Drosophila into the conceptually best understood animal model organism that we have to date. It has not only taught us about how genes are organised on chromosomes and the rules of inheritance, but also fundamental concepts of development, nervous system function, the immune system, our biological clock and jet lag, evolution and population genetics, the genetics of learning, principles of stem cells, and even mechanisms of disease including cancer and neurodegeneration (see Resource 2b “Why the fly?“). But how does this help in classrooms? 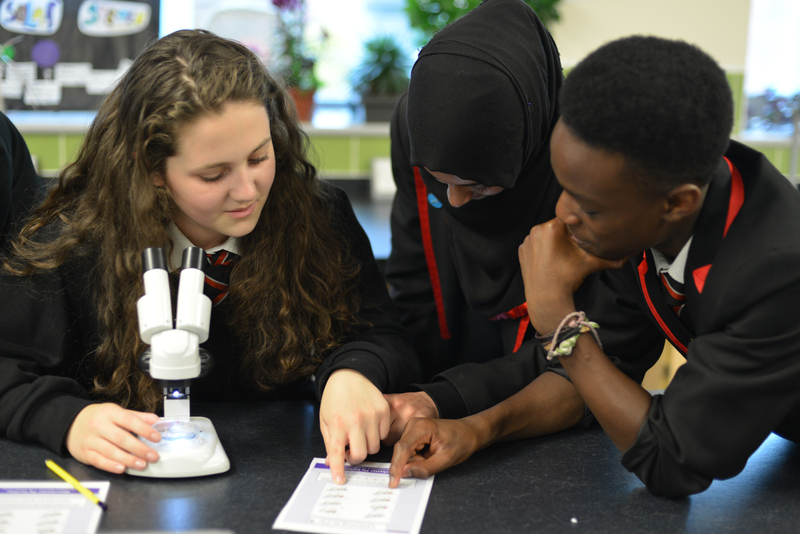 The breadth of biology topics investigated in flies provides potential teaching materials for a wide range of curriculum-relevant biology specifications, ranging from classical genetics to gene technology, gene expression, enzymes, neurobiology and even evolution and behaviour. The sheer volume of knowledge in each of those areas provides a plethora of examples, experiments, anecdotes and facts that can be used to illustrate and make lessons more engaging and entertaining. The depth and detail of conceptual understanding in flies facilitates teaching, based on the simple rationale that teaching is the easier the better the contents are understood. Live experiments: It is straightforward, cheap and ethically unproblematic to use and breed flies in schools, and there are many simple experiments that can be performed (see our sample lessons in the next section). This brings living animals into classrooms which, combined with experiments that reflect relevant contemporary research, tends to leave long-lasting experiences. I frequently talk to people who were taught classical genetics with flies decades ago and still hold positive memories. The breadth of scientific studies in flies reaches across and contributes to a wide range of important topics in biomedical research. There are many ways in which flies can be used as teaching tools in schools. Here we will give some examples for which resources are either provided online already or can be made available upon request. Teaching the life cycle in primary schools is often done using metamorphosis of tadpoles into frogs or of caterpillars into butterflies, but experiencing these examples in real time can only be done during a certain period of the year and takes many weeks. With flies this can be done in one day since all life forms are available at any time, and the whole life cycle can be experienced in real time during less than two weeks (see image below and this LINK). We recently taught life cycle to 10 year olds in primary school with great success. During the lesson, we compared frog and dragon fly, explained the short adult life span of mayflies (showing a film), introduced the concept of complete metamorphosis (accompanied by an activity sheet where children learned which insect groups have a pupal stage), introduced to Drosophila (with the microscope fly activity from section 6 and the “Why the fly?” film), used examples from Drosophila to explain what happens during metamorphosis in the pupa, and eventually explained life cycles of Plasmodium in Malaria and of flatworms in different diseases (making clear why to wash hands after playing outside!). These resources will be made available online, but will be sent out to you upon request. The first version of the scratch computer game based on the Drosophila life cycle. Click to play! In ICT classes, the Scratch program has become a sensible and powerful way to introduce students to the logic of computer programming, and Scratch tempts to be taken on as a hobby at home. To engage on this path, we have published a Scratch-based computer game (see below and LINK) which uses the funny cartoons of the Drosophila life cycle as the basis, and the maintenance of fly stocks against the odds of genetic mutations, parasite infestation and bacterial/viral infections as the story line. Since all programming code in Scratch is open, this game can be modified or developed further. For this, all the used figures (“sprites”) have been made available for download (LINK). Beyond this, we envisage that easy behavioural experiments in Drosophila offer ways to generate biological data that could be analysed using more advanced and well supported programming languages like Python and the cheap computing power made available through Raspberry Pis (LINK). The physiological requirements for life are so fundamental that most of our organs have common evolutionary roots. An active and effective way to learn about our organs is therefore through exploring their commonalities with organs of other organisms. This strategy can capitalise on the vast knowledge that we have about the tissues and organs of Drosophila. To facilitate this, we provide a dedicated webpage describing the structures and fundamental functions of our organs in direct comparison to those of the fruit fly (Resource 1c). Most human organs have a match in flies with shared evolutionary roots, ideal to compare and understand the fundamental requirements of these organs. Combining the gene to protein concept, principles of enzymes, genetic variation and concepts of Evolution. This lesson is fully developed, was tested with eighty Year 13 students (one high achievers class, two mixed ability classes, one support class), a PowerPoint file with adjoint materials is available online (Resource 1a, e, 3b) and a dedicated webpage is available to support revision and homework tasks (Resource 1e). It is an excellent synoptic, end-of-year lesson which establishes conceptual links between at least seven curriculum-relevant biology specifications. These include fermentation, the gene to protein concept, enzyme function, pharmacology and associative learning, genetic variation, and principles of evolution. Students dissect normal and alcohol dehydrogenase deficient fly maggots and use a colour reaction to assess the maggots’ ability to metabolise alcohol. They observe the effects of alcohol consumption on normal and mutant flies, and they compare different alleles of the Adh gene by translating their DNA code into RNA and protein. This lesson offers excellent opportunities to achieve differentiation and to discuss the social relevance of alcohol and alcohol abuse. A simple 5-10 minute colour reaction experiment demonstrating the genetics of enzyme activity. Click for detailed explanations. Neurodegenerative diseases (ND) destroy nerve cells which form the cables that wire our bodies. Some ND primarily affect nerve cells required for body movement, as illustrated here. Learning to draw graphs and use spread sheets using data obtained with living flies in the classroom. This lesson is also available as a resource online accompanied by 5 dedicated webpages (Resource 1a, d, 3a). It was tested on sixty Year 9 pupils. It uses a low-cost, easy to set-up experiment known as the “climbing test”: two groups of flies (one week old teenagers versus five week old seniors) are tapped down in two parallel vials and are given 15 seconds to climb back up, at which point a picture is taken. Students then determine how far the ten individual flies in each vial have climbed on a scale of 0 to 10, usually finding that the young flies show much better motor-performance. This is then used to draw graphs, understand the importance of sample numbers and learn to apply statistics. To illustrate relevance, concepts of ageing and neurodegeneration are introduced accompanied by activity sheets, and examples are provided on how the climbing assay is used during ageing and neurodegeneration research on flies. An easy to monitor experiment with classical genetic markers. All kids love it! This lesson is not yet available online, but will be sent out upon request. During this lesson, students learn about classical genetics and the practical uses of marker mutations as they are applied in contemporary research laboratories (including Punnett squares). For this, excellent low cost dissection microscopes can be used (see Resource 2c “Outreach Resources“), and we developed simple activities where student success in identifying markers is easy to monitor. Furthermore, the lesson provides an insight into the process of scientific discovery (how it was found that genes lie on chromosomes), and how this helps understanding biological phenomena in humans, such as male predisposition to colour blindness. Where transgenic flies are permitted on school grounds, modern genetic markers can also be used, in particular fly strains containing green fluorescent proteins. Using a simple hand-held fluorescent lamp with integrated camera (see Resource 2c “Outreach Resources“), gleaming organs can be observed live in these maggots. Students performing the genetic marker exercise. Comparing electrical versus chemical synapses and understanding them in the context of a simple neuronal circuit. This lesson is not yet up as a resources, although some explanations of its content can already be seen under the “L3-Neurons” tab on the droso4schools site. It starts with a simple request: “Decide to bend or stretch your arm! What happens in your body?”. This simple example forms a powerful story line which introduces to the wiring principles of the nervous system, nerve impulses (action potentials), and the working of synapses. For example, our “5 steps to an action potential” strategy is enormously successful with students already at GCSE stage. The lesson further illustrates the concepts and their application by explaining spinal cord injury and epilepsy, illustrated by shaking epileptic flies into seizure. It illustrates the power of synapses with a little experiment where flies are paralysed through warming them up to body temperature, introducing also to cutting edge technologies and strategies used to study the nervous system. Where transgenic flies are permitted on school grounds, we have simple experiments for the use of state-of-the-art opto- or thermo-genetics (using light or temperature to manipulate nerve cells and fly behaviours; see this TED talk). A simple animation explaining a nerve impulse (action potential). Click for detailed explanations. This lesson and its adjunct support materials can be downloaded from our figshare repository. The online resource can be found here. The lesson is a synoptic resource suitable for Biology A Level (KS5), ideal for end-of-term revision lessons. It starts with the phenomenon of human skin colour, the advantages and disadvantages of dark and light skin, which may explain why they are distributed differently across the globe. By identifying melanin as the pigment reponsible, the lesson raises the question how such complex organic molecules can be produced, leading over to enzymes, and enzymatic/metabolic pathways. 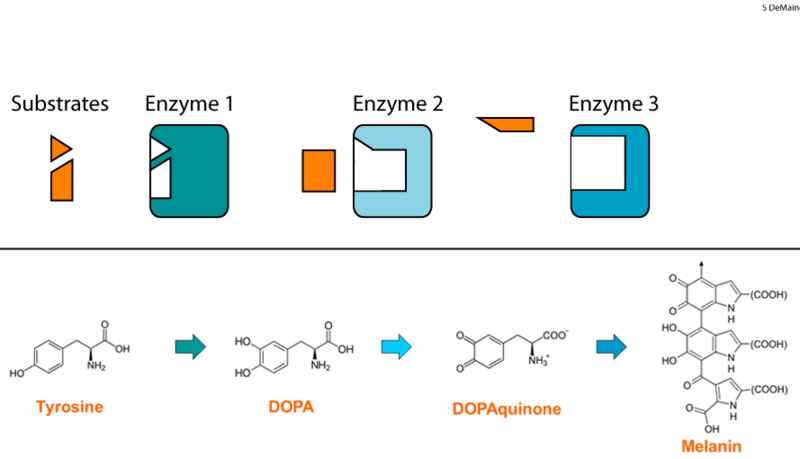 Fundamental principles of these pathways are explained, and then Drosophila eye pigmentation is introduced as an example to illustrate how genetics and biochemistry are used in combination to unravel metabolic pathways. For this, pupils are given chromatography results of normal and mutant flies which display changes in their eye colours and work out the enzymes affected by the respective mutations. This understanding is then related back to the initial question of human skin pigmentation: (1) first comparing and contrasting metabolic pathways of fly eye and human skin pigment, then (2) understanding how skin tone can be changed as the outcome of genetic alterations of the metabolic pathway and, eventually, (3) how evolutionary selection processes can explain the different distribution of skin colour across the globe. This resource is accompanied by a worksheet for the chromatography analysis and a homework task recapitulating some areas of the lesson and beyond, but also helping students revise and consolidate knowledge from several areas. This lesson is not yet available online, but please request the presentation and adunct materials from Andreas.Prokop@manchester.ac.uk . The online resource can be found here. This lesson is a synoptic resource suitable for Biology A Level (KS5), ideal for end-of-term revision lessons. The lesson starts by recalling fundamental knowledge about our senses, with emphasis on visual information obtained from our environment. It then focuses on light and light perception, starting with the physical nature of visible light as a small fraction of the wide spectrum of electromagnetic waves, which are introduced via a brief interactive PowerPoint animation. The question is posed as to why we see only this narrow fraction of the spectrum, providing our evolutionary origins in the oceans as a likely explanation because visible light is little absorbed by water and reaches fairly deep down. The lesson then explains the principle of seeing an object by reflection (also introducing to the subtractive colour model), and introduces to eye anatomy by comparing a lens eye to a camera. In a comparative approach, lens eyes are compared to compound eyes of the fruit fly Drosophila (as typically found in arthropods, such as insects, crustaceans, arachnoids). For both eye types, the idea of perception in the eye and conduction to the brain for information processing is explained. The next topic is phototransduction (i.e. the transformation of light into nerve impulses). It starts with the stereo-isomerisation of retinal embedded in opsins and the subsequent triggering of a signalling pathway which eventually elicits the nerve impulse sent to the brain. This process is explored using an animation which the pupils interpret step-by-step. A micro experiment uses Drosophila to explore the idea of positive phototaxis (movement towards light) as a measure to explore what colours of visible light an animal can sense. Then sevenless mutantf flies and Ishara plate tests are used to introduce to the idea of colour blindness. The underlying concepts of cone cells with three different colour opsins are introduced together with the additive colour model and the idea of mutations that affect opsin genes. Finally, red-green blindness is used as an example of X-chromosomal inheritance, also reminding of the uses of Punnett squares. Many more curriculum-relevant topics can be taught using Drosophila as a modern teaching tool, and we are curious to hear which ones would be of interest to you. We are keen to collaborate with you to implement such lessons. Feel free to contact us: Andreas.Prokop@manchester.ac.uk and Sanjai.Patel@manchester.ac.uk. 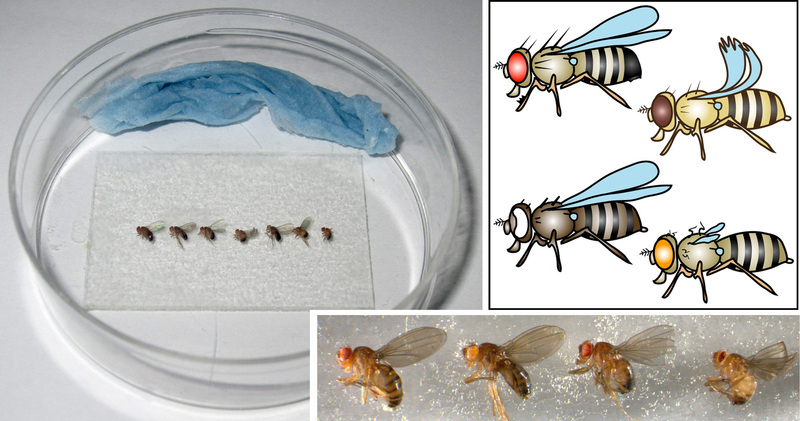 the “Organs” page compares tissues and organs of flies and humans with helpful overview images. the “L3-Neurons” tab is half populated and contains background information on the nervous system lecture which will be uploaded soon. the “Outreach Resources” page lists about 100 links to information and resources that can be useful for outreach work and teaching at school and university levels. thanks to the team for commendable work. May I use some of the pictures on this website? I am making my own sit and I love the simplicity of the photos! Thank you for the helpful information! Thank you to the team, I love this website. The pictures will be only to be downloaded for education purposes. I am making a website for my gifted class, to inform them of the reproduction of maggots.